"Squall" is the twenty-ninth boat to be built by the Perini Navi boatyard. Her English name was chosen by the yard to highlight the performance this pleasure boat is capable of, thanks to design details meaning fast, safe sailing. "Squall"'s design is based on the requirements of her owner, who requested a sailing boat with a high level performance when sailing, not only speed therefore, but also to be able to sail into the wind and therefore to be close- hauled. "Squall" has a 52-metre aluminium hull with a maximum beam of 10.30 metres, fixed keel and 90,000 kg bulb, combined with two carbon masts on which up to 1,441 sq/m of canvas can be raised. She has a maximum speed of over 17 knots under sail and with her powerful 1,398 HP engine reaches a maximum speed of over 14. Perini Navi entrusted the design of this impressive ketch to the well-known English studio of Ed Dubois, working in synergy with the boatyard's own team, to produce a yacht that would be the forerunner of a whole series of high level performance sailing super-yachts. The interiors were designed by the French studio Dernier Etage along with Perini Navi, and are mainly in walnut and wengé, woods that manage to make each room suitably welcoming and elegant. The generous bridge house in the bows has a full beam control station, where we can find a great deal of new generation electronics in a warm, cosy environment, communicating with the bar zone in the bows to port, with the dining area to starboard and with the lounge towards the stern, all in modern style wood furnishings plus inserts in steel and leather. The same style runs throughout with plenty of light streaming through large windows in the upper works and, although accessible, these relaxation areas are ideally separated from the bridge and its navigation equipment by walls and a glass door. All the interiors have been designed for ideal living by the owner and his guests even during long cruises: therefore, lots of cleverly furnished room with no lack of areas for relaxation and privacy. Even outside there is plenty of space everywhere, for example, the bow area includes the double external wheelhouse complete with navigational instrumentation repeaters forward of which there is a relaxation zone covered by the extension of the wheelhouse roof that contains two tables, sofas, bar unit and other elements. This Italian boatyard produces pleasure sailing boats that always have high levels of performance and an avant-garde technological content. Thus the yard has announced that it is studying the production of a boat with a sail layout similar in shape to that of the sailing vessels of old, in other words, a sailing boat equipped with three masts, raising not Marconi but square sails. Naturally, even in this case and despite rigging practically dissolute nowadays, Perini Navi will be developing solutions for noteworthy performance on a level with the boatyard's worldwide fame. 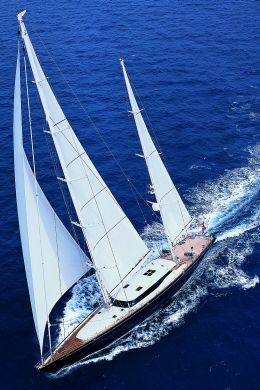 For further information: Perini Navi, via M. Coppino 114; 55049 Viareggio (LU) Italy; tel. +39 0584 4241; fax +39 0584 424200; sito web www.perininavi.it; e.mail info@perininavi.it. Total sail area: 1,441 sq/m.